Moment exit poll was announced Jump to media player The BBC's David Dimbleby announces the results of the exit poll after the UK's general election. What matters to a fisherman? Jump to media player John McAlister is a 60-year-old fisherman with a family business from Oban, Scotland. Cheat's guide to the election campaign Jump to media player Buses, debates, rows and celebrity - BBC News rounds up the highlights of the election campaign. What happens if no party wins the election? Jump to media player What happens if no one party win the general election? We asked some kids and the BBC's political expert, Ross Hawkins to explain it for us. 'Squatting' in Downing Street Jump to media player Newsnight's cartoon guide to who will be in charge on Friday if no one wins the general election on Thursday. Election 2015: Where the parties stand Jump to media player Election 2015: The BBC's Vicky Young looks at some of the key issues and where the parties stand. Why is the economy such a big issue? Jump to media player Why is the economy such a big issue in an election? BBC's political expert Chris Mason explains. The Conservatives are set to be the largest party in the Commons but just short of a majority, according to the general election exit poll. The survey taken at polling stations across the UK suggests the Tories will get 316 MPs to Labour's 239 when all the results have been counted. It suggests the Lib Dems will get 10 MPs, the SNP 58, Plaid Cymru 4, UKIP 2 and the Greens two. The exit poll was conducted by NOP/ MORI for the BBC, ITV and Sky. 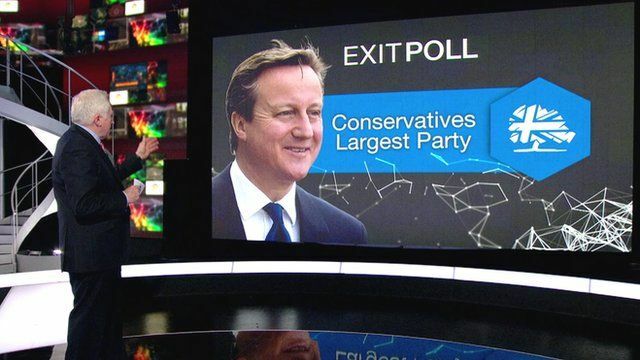 The BBC's David Dimbleby announced the results of the exit poll at 22:00 BST, once the voting had closed. Go to next video: What matters to a fisherman?